Well, that didn’t take long. Just a week ago, I was posting excitedly that the Great Hall had finally reached 1,000,000 students. Regardless of who wins the first House Cup, I suspect the site will experience steady growth… but that there will be a big growth spurt when CoS is released and everybody – the PS/SS Beta group and the general public – explores CoS for the first time, at the same time, together. Pottermore: The Great Hall Reaches One Million Students! 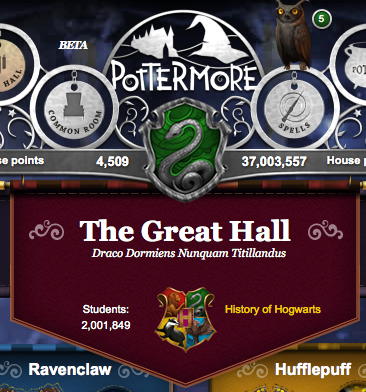 As of the moment I started writing this post, there were precisely 1,000,223 students in the Great Hall at Pottermore. These are the students who have been to Diagon Alley, taken the Hogwarts Express, and gone through the Sorting Ceremony. When I joined the Beta test, there were about 100,000 students in the Great Hall. The number never reached 700,000 during the Beta – probably because so many people got multiple accounts and never used them… or deleted the accounts they got when they didn’t get sorted into the House they wanted. This afternoon, my husband joined us in the Great Hall after being sorted into Ravenclaw. So we’ve now officially got a Slytherin/Ravenclaw marriage. Most of his responses to the sorting quiz were similar to mine, but there was definitely a Ravenclaw edge to his… and a Slytherin edge to mine. 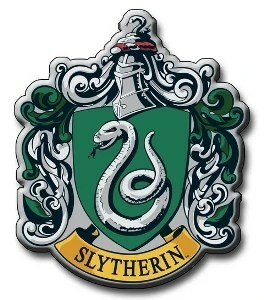 So I think I can now say with some assurance that Ravenclaw is the next House I would go into after Slytherin. Oh by the way… in the few minutes that it took me to write this post, the number in the Great Hall jumped to 1,000,904. So approximately 700 students have been sorted in just the last five minutes. It’s just so great to see Pottermore finally open to the public. If there’s one thing that defines the #HP fandom it’s our ability to bridge differences & work together and the Bat Signal is proof of that. After having seen some pretty nasty fan factions and fanwars, it has truly been refreshing this past week to watch fans work together to help other fans gain early access into Pottermore. After the Magic Quill challenge rules went live on the Pottermore website (about 2am BST, July 31), one forum member at Chamber of Secrets posted her email from LeakyCon giving out the basic timing for Clue #1 and telling us the Chapter we needed to look at. That member is a James fan. 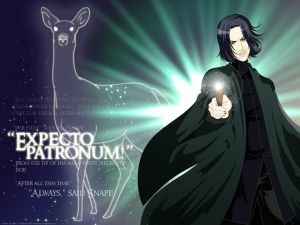 I’m a Severus fan. It just didn’t matter. Her post gave me – and all the other HP fans on that thread – hope that we could, indeed, make it through the Magic Quill challenge together and gain early access into Pottermore. By early morning, most of us had. That experience inspired my blogging during this past week. So on that note, I’d like to thank some folks who helped with this experience along the way. A Special “Thank You” to..
Jess at The Last Muggle, who tweeted the Day 5 Hints, gave me a tip about hp_batsignal in one of the Comments threads, and mentioned this site on her blog. If you don’t read Jess, please do. She writes one of my favorite Harry Potter blogs. I’m excited – and nervous – about the Sorting. I want to be in Ravenclaw or Gryffindor. 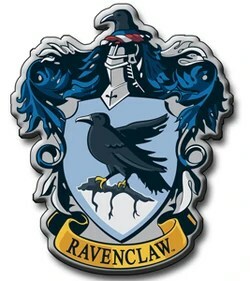 I’m a Ravenclaw on Mugglenet Interactive, a Gryffindor on Chamber of Secrets, and I “test” all over the map on various unofficial Sorting tests. In fact, in the time it took me to write this paragraph, I tested across the Web as Gryffindor, Slytherin, Ravenclaw, and Hufflepuff! But please, Sorting Hat, I beg of you… do not put me in Hufflepuff. I’m thrilled at the prospect of getting a wand. I’m kind of hoping that my username will help me get a wand with a Phoenix tail feather core. Not because I think I’m Harry Potter (and especially not Tom Riddle! ), but just because I really love the Phoenix. Second choice: Unicorn tail hair. I’d prefer not to end up with Dragon Heartstring. If you’ve roamed this site, then you probably know that I’ve posted an almost complete solution of Snape’s Logic Puzzle (the puzzle that guards the Philosopher’s Stone). The reason the solution is almost complete is that, without a visual cue, we can only get down to the last two bottles with any certainty. Well, finally, to the rescue… There is a photo supposedly leaked from Pottermore showing the exact arrangement of the bottles in the puzzle. If that photo leak is for real – and not just a clever piece of fanart – then we will soon have our complete solution! We know that we’re finally going to learn more about some of the Houses – especially Ravenclaw and Hufflepuff. We’re going to get some McGonnagall backstory and some Dursley backstory. We’re going to get a lot of wandlore. And probably plenty of other material. So far, JKR has written about 19,000 additional words for Pottermore. So what is some of the new content that you’re hoping to see? And what are some of the Pottermore features you’re most excited about? (And btw… Actually, this Severus fan gets along just fine with the James fan who posted the LeakyCon message… but the point is that a lot of fans have reached across their differences this past week just to help out other fans. YAY!). They were standing on the edge of a huge chessboard, behind the black chessmen, which were taller than they were and carved from what looked like black stone. Facing them, way across the chamber, were the white pieces. Harry, Ron and Hermione shivered slightly – the towering white chessmen had no faces. “Now what do we do?” Harry whispered. [Ron] walked up to a black knight and put his hand out to touch the knight’s horse. At once, the stone sprang to life. The horse pawed the ground and the knight turned his helmeted head to look down at Ron. Unlike Professor Flitwick’s complex task, this one is fairly straightforward – once it’s figured out. The prospective thief has to take the place of a black chess piece and play a successful game of chess. But therein lies the problem. While it takes intelligence to play chess, having intelligence is no guarantee of success. Chess is a game of strategy, and so it takes a strategic thinker to win at it – someone who can see the big picture, comprehend the implications of the opponents’ moves, and plan moves in advance. In other words, it takes a specific type of intelligence. This is what makes McGonnagall’s task rather brilliant. It narrows the field considerably concerning who would be able to get to the next door. Hermione herself (minus Ron) would likely not have passed successfully through this task. But Why Is This Task for Gryffindor? Shouldn’t chess be more of a Ravenclaw specialty? I mean, in RL it is the province of those crypto-Ravenclaws of the Muggle world – Math and Computer geeks. So why should this be the task for the Head of House for Gryffindor? Transfiguration: Well, the most obvious answer is that the task requires the pieces to undergo Transfiguration spells… and Transfiguration is McGonnagall’s specialty. In fact, it seems that Transfiguration is something of a Gryffindor specialty. Such noted Gryffindors as Professor Dumbledore have specialized in Transfiguration. And several recent Gryffindors (three Marauders and Professor McGonnagall) are known to be capable of making the animagus transformation (not technically Transfiguration, but certainly requiring Transfiguration skills as a prerequisite). Transfiguration, according to McGonnagall, is among the most “complex and dangerous magic” taught at Hogwarts – the danger, perhaps, being a reason the discipline seems to coalesce around Gryffindor. But thus far (at Hogwarts at least), we’ve seen mainly the lighter side of Transfiguration. We’ve watched Professor McGonnagall transfigure her desk into a pig (and back again), teach her First Years to change a match into a needle, and test them on turning a mouse into a snuffbox. In the chess task, we finally see the more serious application of Transfiguration. War: Additionally, chess is a warlike game, involving pieces that emulate soldiers crossing a battlefield. The game, in fact, is won by capturing the opposing player’s King. 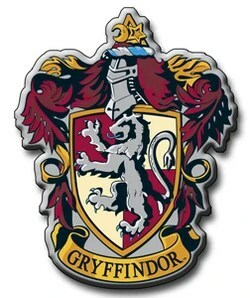 Gryffindor, of course, is the most warlike of Houses – the House that most highly values bravery and chivalry. And McGonnagall’s version of chess creates an aura of battlefield danger, guaranteed to unnerve your average prospective thief. [The Trio’s] first real shock came when their other knight was taken. The white queen smashed him to the floor and dragged him off the board, where he lay quite still, facedown. Every time one of their men was lost, the white pieces showed no mercy. Soon there was a huddle of limp black players slumped along the wall. McGonnagall’s transfiguration transforms a game based on war into an actual simulation of war. Strategy: Smart as the Ravenclaws are, and crafty as the Slytherins, the best strategic thinker in the series is Albus Dumbledore – who manages the wars against Voldemort like a master moving pieces around the board. While Dumbledore’s Slytherin protegé, Severus Snape, is a brilliant tactician, Snape is not essentially a strategist. And this perhaps shows us something about the differences between Ravenclaw intelligence, Slytherin intelligence, Hufflepuff intelligence, and Gryffindor intelligence. Ravenclaw is often said to admire abstract, theoretical knowledge. Slytherin admires skill and practical application. Hufflepuff emphasizes an earthy, pragmatic, common-sense approach. But despite its reputation (largely among Slytherins) for reckless action, Gryffindor, perhaps, brings the strongest capacity for strategic thought. Certainly the evidence for strategy being the most Gryffindorish type of intelligence is a bit thin if we base it entirely on Dumbledore, but if we consider that strategy is the quality most desired in warfare – and martial ability is a huge part of the Gryffindor portfolio – then we perhaps have a more solid circumstantial basis for linking Gryffindor with strategic intelligence. So What Do We Learn about McGonnagall? She’s pretty formidable – far more formidable than the no-nonsense witch who sternly greets new students. Not only does she perform the necessary transfiguration to animate the pieces, she “programs” the white pieces to respond to the black strategy and create a dynamic strategy for defense of the Stone. (Curiously, too, she uses the traditional color scheme of white representing the “good” defenders of the Stone and black representing the “bad” prospective thieves). Additionally, this simulation of battle foreshadows what we will ultimately see of McGonnagall in the context of a real battle in DH – as she defends Hogwarts against the minions (and assumed minions) of the Dark Lord. “And now – Piertotem Locomotor!” cried Professor McGonnagall. And all along the corridor the statues and suits of armor jumped down from their plinths, and from the echoing crashes from the floors above and below, Harry knew that their fellows throughout the castle had done the same. Clattering and yelling, the horde of moving statues stampeded past Harry: some of them smaller, others larger, than life. There were animals too, and the clanking suits of armor brandished swords and spiked balls on chains. That is the quintessentially Gryffindor Professor McGonnagall in the context of war. She takes charge. She defends the school. And she shows no mercy to any she believes would dare overthrow Hogwarts.